What is a triglyceride diet? What foods to include in this diet? Why is it important to adjust triglycerides levels? Get your step-by-step answers here. I am sure you are paying a great attention to your blood pressure as well as your blood sugar levels, and even may be you are keeping an eye on your total cholesterol levels, but what about triglycerides levels in your blood? Have you checked them recently? What is a triglyceride diet? What foods to include? Actually, it contains the strategies of selecting the foods you need for the daily energy. And also how you can cook these foods, the best and healthiest methods of cooking. Eventually, a proper diet for high triglycerides levels, will help you overcome hypertriglyceridemia too. Below you'll have the seven strategies advised from the American Heart Association when following the triglyceride diet. If you are an obese person, try to reduce your daily calories intake to lose excess kilograms and reach your normal body weight. This will involve deserting most sources of fats, starches, proteins, and sugars. Try to decrease your consumption of saturated fats, trans-fatty acids and cholesterol. Avoid alcohol; even small doses can alter your serum triglyceride level. Your triglyceride diet must contain plenty of vegetables, fruits, lean meat, and skimmed dairy milk products. If you already have hypertriglyceridemia, you must replace saturated fats in your diet with unsaturated fats (either mono or poly). Oils like olive oil and canola oil are rich in unsaturated fats. Don’t try to replace fats with carbohydrates in your triglyceride diet, because this will only lead to hypertriglyceridemia, besides lowering your good “HDL” cholesterol. Eat fish rich in omega-3 fatty acids (like salmon, sardine, albacore tuna, and mackerel); you can always choose them as your main source of proteins instead of red meat. Why is it important to adjust triglycerides levels? According to the American Heart Association, the chemical formula of triglycerides is the most abundant fat formula found in your foods as well as in your body. For your information, both triglycerides and cholesterol form your plasma lipids. Hypertriglyceridemia is the presence of extra amounts of triglycerides in your blood. It is also well known of being directly related to the development of coronary heart diseases. 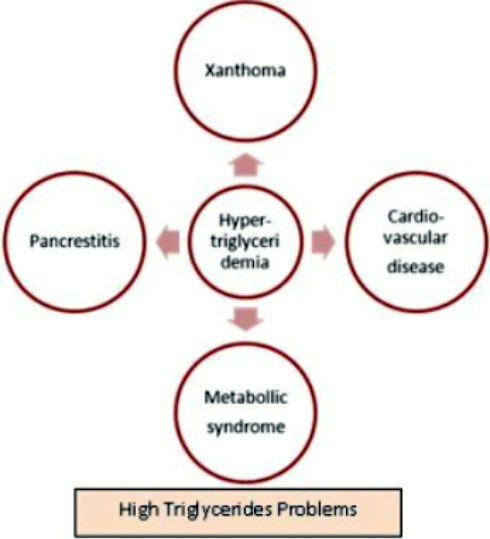 Until now, the scientists don’t know how high triglycerides can cause atherosclerosis (hardening of the arterial wall), but they are sure that high triglycerides level is usually a manifestation of some serious diseases that cause coronary heart diseases and strokes, such as overweight and metabolic syndrome (a group of diseases which involves accumulation of adipose tissue around the waist, accompanied with hypertension, hypertriglyceridemia, elevated blood sugar and high cholesterol level). Your doctor can estimate your plasma triglycerides level when checking your lipid profile (lipid panel) test, which is used to measure your total blood cholesterol as well. Unfortunately, in order to obtain accurate measurements for this test you will have to fast from alcohol and food for nine to twelve hours before your blood sample is taken. At the end, since the problems coming from the hypertriglyceridemia are huge and involve all your body, you may easily understand the importance of keeping your blood triglycerides levels under control. Start with lifestyle changes and low triglyceride diet. And if you fail, your doctor will be constrained to prescribe some medicines. The natural way of balancing your triglycerides or any other “mis-balanced” lipids in your body is the best way. But if it is need for medication, go ahead and follow your doctor advises. Good luck. Stay firm. Keep healthy. Is it possible to lower Triglycerides Naturally? Find out how to recognize the High Triglyceride Symptoms in time. Discover how to live happily with Low Triglycerides. Get to know the Foods that Lower Triglycerides. 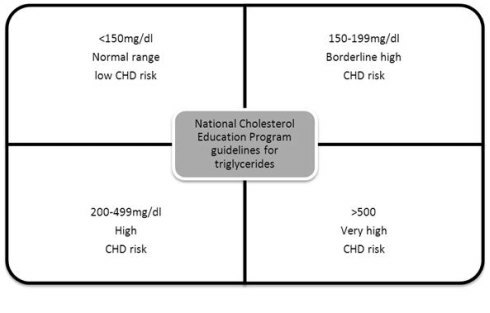 Your keypoints of how to lower Triglycerides Naturally. Get to know the secrets of lowering Elevated Triglycerides.